Providence Catholic High School Principal, Dr. John Harper, announced Allison Brankin as the Class of 2019 Valedictorian and Alyssa LaBine as Salutatorian. “We are very proud of these academically gifted students who are very strong leaders among their peers both in and out of the classroom. We know they have very bright futures,” offered Harper. Valedictorian Allison Brankin (pictured left) is the daughter of Patrick and Susan Brankin. She is a graduate of Cardinal Joseph Bernardin Catholic School, a parishioner at Saint Elizabeth Ann Seton and a resident of Orland Park, IL. Brankin will attend the University of Notre Dame and will study Chemical Engineering. Allison has been a member of the Providence Catholic high honor roll all semesters and is a member of the National Honor Society. Brankin is an AP Scholar with Honor and an Illinois State Scholar. She has received numerous academic subject awards from the school including AP US History, Chemistry Honors, English 2 Honors, English 3 Honors, AP Chemistry, and Church History. Outside of the classroom, she is active as a member of Student Council, Augustinian Youth Ministry and a sacristan for all school masses while being a participant in the Student Augustinian Values Institute. She is also a Eucharistic Minister, Student Ambassador, Celtic Time Leader, Kairos leader, and in Spanish National Honor Society. 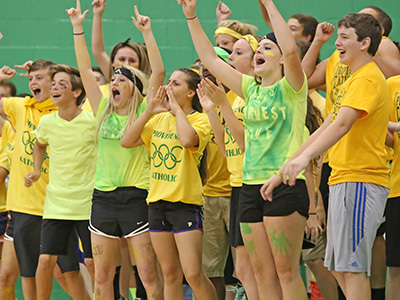 In addition, she has been a member of the PCHS volleyball team and was named team captain this year. She was also awarded the GCAC Top 10 Female Athlete Award and GCAC Academic All-Conference award. Outside of school, she coaches and referees volleyball games at Cardinal Joseph Bernardin Catholic School. Salutatorian Alyssa LaBine (pictured right) is the daughter of Brett and Lori LaBine, LaBine is a graduate of St. Mary Mokena, a parishioner at Palos Community Church and a resident of Mokena. LaBine will be attending Barrett the Honors College at Arizona State University and will study Biomedical Engineering. 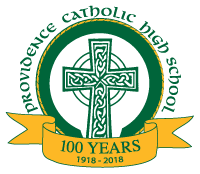 LaBine has been a member of Providence Catholic high honor roll all semesters and is a member of the PCHS National Honor Society. She was recognized as an AP Scholar and National Merit Commended Student. LaBine has also won numerous class awards for Geometry Honors, English 1 Honors, Old Testament, Algebra 2 honors, Spanish 4 Honors, and Honors Physics. She is also a member of the International Thespian Society, Tri-M Music Honor Society, and Spanish National Honor Society. Throughout her four years, she has been a part of the Providence Catholic Theatre, Girls Swim Team, Augustinian Youth Ministry, Respect Life Club, International Club, Mock Trial Team, Girls Golf Team, and a Sacristan. LaBine was also selected to compete in the IHSA Solo and Ensemble Competition, ILMEA District 1 Choir, IMEC All-State Choir, and IMEC All-State Honors Choir. Outside of school, she volunteers at Palos Community Church High School Youth Group, Palos Community Church Vacation Bible School, Smith Crossing Senior Living Facility, and a costume volunteer for St. Mary Mokena spring musicals. Our average composite ACT Score is consistently higher than the Illinois average (see date in table below). Our Academic Awards ceremony was held on Monday, April 15, 2019. Congratulations to all students who received an award for their outstanding performance! We are pleased to announce that 34 Providence Catholic students have earned AP Scholar Awards by the College Board in recognition of their exceptional achievement on the college-level Advanced Placement ® Program Exams, which were taken in May 2018. The National Merit Scholarship Program is an annual academic competition for recognition and college undergraduate scholarships that began in 1955. More than 1.5 million students enter the National Merit Scholarship Program each year. Approximately 34,000 students are named Commended Students. Providence Catholic National Honor Society is founded on the principles of scholarship, leadership, character and service. The selection process begins when students who meet academic qualifications are given applications for NHS membership. 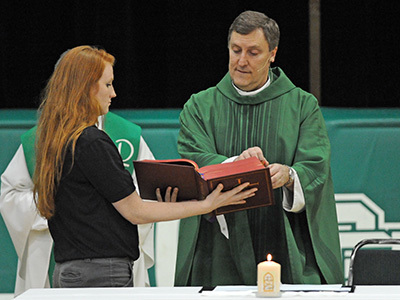 Once the student completes their application, Providence Catholic faculty members are asked to evaluate the candidates on the four guiding principles. Finally, the Faculty Council reviews the prospective students and makes the final decision on membership. The following Providence Catholic students were named Illinois State Scholars. Selection is based on ACT scores received prior to senior year and other critical criteria as determined by the Illinois Student Assistance Commission. View/print a list of college scholarships accepted by our most recent graduating class. Faculty members from each academic department select students for this award based on academic achievement, as well as attitude, effort, and improvement. View the honorees for each month below. 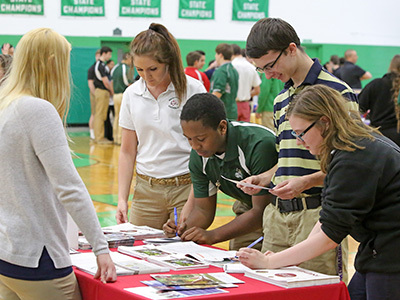 Providence Catholic is proud to have so many young men and women achieve academic excellence. There are three ways to view the honor roll recipients; select the appropriate links below.